HAPPY & PROSPEROUS NEW YEAR. A BUSY YEAR HAS PASSED, WE ARE MISSING THOSE WHO ARE NO LONGER WITH US, BUT WE HAVE (AND ARE) DOING OUR UTMOST TO HONOUR THEIR MEMORY AND CARRY ON WITH DOCUMENTING AND BRINGING THE HISTORY OF OUR VILLAGE TO THE PEOPLE WHO HAVE LIVED HERE AND THOSE WHO HAVE CHOSEN TO LIVE HERE NOW. OUR OPEN DAY, ON DECEMBER 2nd, AT THE BETHEL WAS A SUCCESS, EVEN THOUGH WE HAD TO MAKE DRASTIC CHANGES TO MAKE IT HAPPEN.THE GODS WERE AGAINST US – THE ROADWORKS, THE WEATHER, THE PRODUCTION OF THE BOOK AND THE CHANGE OF DATE. ALL THE REPORTS WE RECEIVED WERE GOOD AND THERE WERE PEOPLE WHO HAD NOT COME BEFORE. THE LATEST TOME OF THE “DEFINITIVE HISTORY” SOLD OVER 100 COPIES AT THE EVENT. THEY SHOULD BE AVAILABLE FROM OURSELVES AND ALSO FROM “MARTIN’S” IN CANNOCK, “PREECES NEWSAGENTS” IN NORTH STREET AND “HOLLYBUSH GARDEN CENTRE” IN CHESLYN HAY. THE NEXT ONE TO BE PRODUCED SHOULD BE ALL ABOUT THE “BRAG” (BRIDGTOWN RESIDENTS ACTION GROUP) ERA. THE NEXT TALK WILL BE ON WEDNESDAY 16th JANUARY 2019 AT THE BETHEL STARTING AT 10.00am AND WILL BE FROM A MEMBER , Mr STEVE GEALE WHO WILL TALK ABOUT “STAFFORD GAOL”. 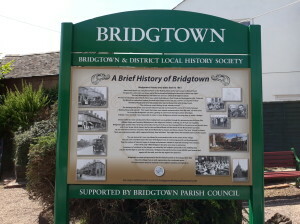 URGENT NOTE : WE ARE RUNNING OUT OF MATERIAL FOR THE BRIDGTONIAN – SO IF ANY OF YOU HAVE ANY BRIDGTOWN RELATED HISTORY OR STORIES THEN PLEASE FORWARD THEM TO DAVID WILLIAMS OR ONE OF THE COMMITTEE MEMBERS. ANY WAY YOU WANT TO DESCRIBE THEM IS OK AS IT WILL BE EDITED BY DAVID BEFORE PUBLICATION. WEDNESDAY 21st NOVEMBER AT THE BETHEL CHURCH, 10.00 TO NOON WILL BE OUR NEXT SPEAKER. KERRY FROM CANNOCK LIBRARY WILL GIVE AN INSIGHT INTO THE HISTORIC BACKGROUND OF CANNOCK TOWN. PREPARATIONS ARE UNDERWAY FOR THE ANNUAL EVENT ON DECEMBER 2nd AT THE BETHEL CHURCH. WE WILL BE OPEN FROM 10.30 TO 2.30 AND WILL INCLUDE THE NEW BOOK LAUNCH AND EARLY MINCE PIES. FIRSTLY, I MUST APOLOGISE IF SOME OF YOU COULDN’T ACCESS THE SPRING 2018 WEB VERSION OF THE BRIDGTONIAN, BUT I ONLY JUST NOTICED IT WAS IN A DIFFERENT FORMAT. I HAVE NOW CHANGED IT TO THE PDF FORMAT USED BY ALL THE OTHERS. THE ANNUAL EVENT WHICH HAS BEEN MOVED TO 2nd DECEMBER 2018 AT THE BETHEL CHURCH WILL NOW HAVE A DIFFERENT FORMAT DUE TO THE SIZE OF THE BETHEL AND FOR THIS YEAR AT LEAST WILL INCLUDE THE XMAS FESTIVITIES AS WELL AS THE BOOK LAUNCH. THE THEME OF THIS YEARS EVENT WILL BE “CELEBRATING BRIDGTOWN”. MORE OF THIS AFTER OUR NEXT PLANNING MEETING ON OCTOBER 3rd. THERE WAS A DISPLAY TEAM AT THE CHESLYN HAY EXHIBITION AGAIN THIS YEAR. THANKS TO KATH PAGE, JOHN DEVEY AND BARRIE AND JEANETTE CARTWRIGHT FOR THEIR HELP. LAST MONTHS TALK BY BARRY PICKIN ABOUT THE REMEMBRANCE POPPY AND THE UNKNOWN SOLDIER WAS AN EVOCATIVE AND EMOTIONAL ONE AND MANY THANKS GO TO BARRY FOR HIS GREAT TALK. THIS MONTHS TALK, DUE TO THE CHANGE IN DATES, ON 17th OCTOBER, KATH PAGE HAS AGREED TO GIVE A PRESENTATION ON HER VISIT TO CHINA. I HOPE YOU CAN ATTEND AS IT WILL BE AN INTERESTING TOPIC. ON ANOTHER NOTE , TWO OF THE HISTORY SOCIETY TEAM WERE INVOLVED IN THE ROYAL AIR FORCE ASSOCIATION FREEDOM OF CANNOCK CHASE PARADE THROUGH HEDNESFORD ON 29th SEPTEMBER. BOB LEIGHTON AND BOB BREVITT, DONNED THEIR RESPECTIVE SERVICE BERETS TO JOIN OTHER VETERANS ALONG WITH THE RAF BAND, RAF COSFORD TRAINEES, ATC AND CCF FROM THE AREA AND THE CHAIRMAN OF THE COUNCIL AND LORD LEIUTENANT OF STAFFORDSHIRE . DUE TO UNFORESEEN CIRCUMSTANCES OVER VENUES AND THE NEW BOOK – THE ANNUAL EXHIBITION HAS BEEN POSTPONED UNTIL 2nd DECEMBER 2018 AT THE BETHEL CHURCH. WE HOPE TO HAVE THE NEXT INSTALLMENT OF THE BRIDGTOWN HISTORY SERIES OF BOOKS READY FOR THAT DATE . IF YOU KNOW ANY MEMBER WHO DOESN’T HAVE WEB ACCESS PLEASE TELL THEM ABOUT THE CHANGE. 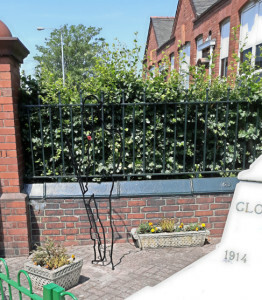 More on the dedication of the Heritage Board and Bench at the Leighton Memorial, Union Street and the outline figures of the soldiers on guard at the Memorial. 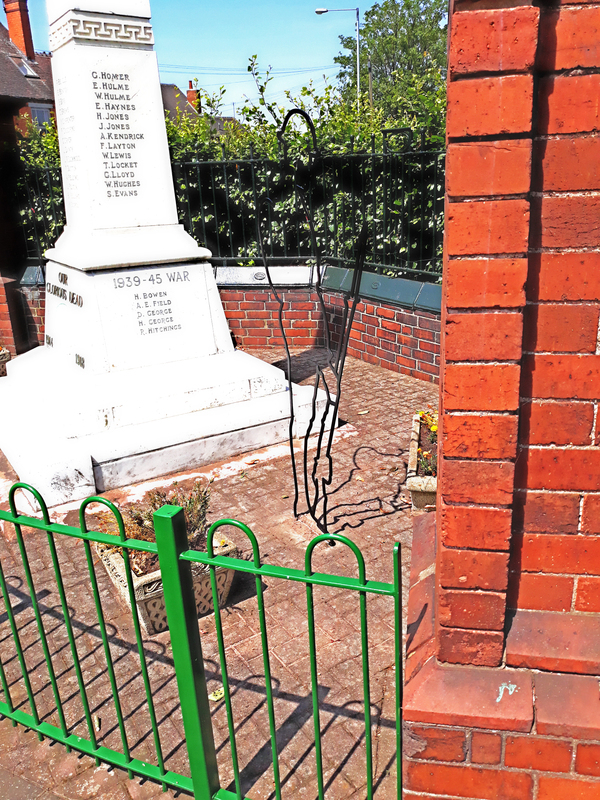 The dedication ceremony was carried out by the Reverend Edwin Myers from the Bethel Methodist Church and the memorials were unveiled by children from the church. In attendance were the Chairman and members of the Parish and district councils along with veterans from the Royal Engineers and active servicemen from the Royal Military Police and the Territorials. After the dedications were completed all went to the Bethel where various speakers gave updates on the dedication and a service was held by Rev. Myers. Refreshments were then the order of the day. 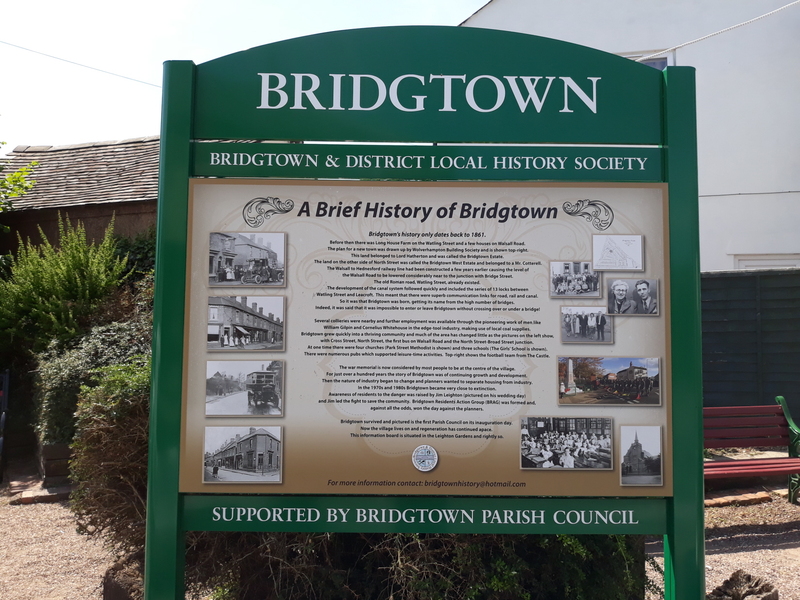 THIS BOARD DESCRIBES THE BEGINNINGS OF BRIDGTOWN AS A VILLAGE AND THROUGH TO THE PRESENT DAY, IT’S UPS AND DOWNS AND ITS FIGHT AGAINST LOSING THE VILLAGE TO INDUSTRY WITH THE LOSS OF A GREAT SPIRIT. THAT FIGHT WAS WON AND THE LEIGHTON MEMORIAL IS PART OF THAT FIGHT. JIM LEIGHTON AND HIS IDEAS FOR AN ACTION GROUP TO TAKE ON THE “BIG BOYS” HAS BECOME A PART OF HISTORY THAT CHANGED THE LAWS OF THE COUNTRY. 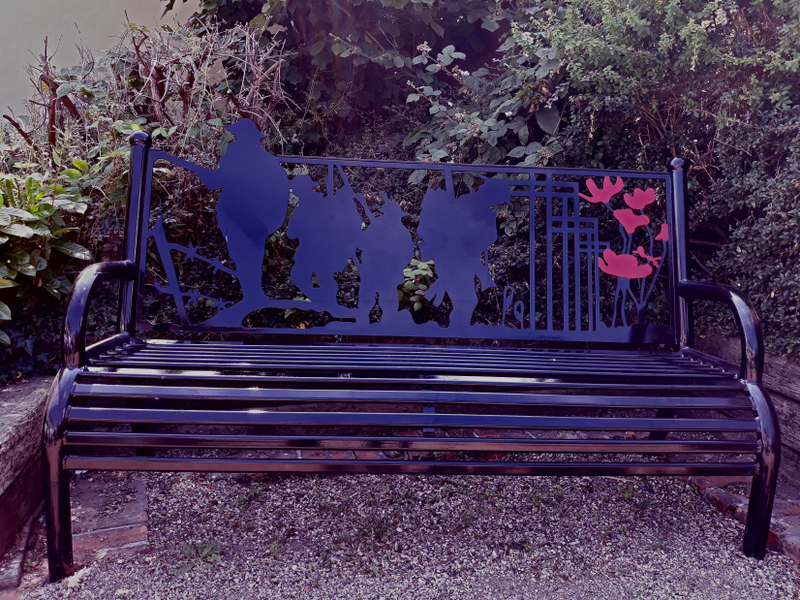 The memorial bench was commissioned and installed by the Bridgtown Parish Council, a memorial to those in village who fought and died for their country and commemorating the ending of the Great War 100 years ago. “SPIRIT OF SOLDIERS” STANDING GUARD OVER THE MEMORIAL IN PERPETUITY. THE SOLDIER “GHOSTS” STANDING GUARD OVER THE MEMORIAL IN PERPETUITY. AGAIN THESE WERE COMMISSIONED BY THE PARISH COUNCIL AND STAND AS A REMINDER THAT THE MEMORIAL IS A SACRED PLACE AND THAT THE WAR BROUGHT TOGETHER PEOPLE WHO WOULD NOT NORMALLY INTEGRATE. THESE OUTLINES DEPICTING THE SPIRIT OF THE SOLDIERS ARE WATCHING OUT FOR THEIR COLLEAGUES AS THEY WOULD HAVE DONE IN LIFE. A POIGNANT AND APT COMMEMORATIVE . There will be an informal coffee morning Wednesday 4th July at the Bethel. Please come and have a coffee a chat with friends, Old & New, or if you have any stories or questions about Bridgtown and its surrounding area there will be members of the society on hand to help. There is no agenda here, just a meeting of like minded folk who like a chat. Refreshments will be provided. 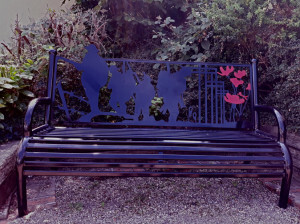 There was a dedication at Leighton Memorial Garden of the latest Heritage Board and a new Memorial bench. More later. The visit of the relatives of Ma Pardoe, a legend in the brewing business in the Black Country, made for a fantastic talk on the history of Ma Pardoe AKA Doris Clare Jones from her roots in Bridgtown to her “Old Swan” Pub & Brewery in Netherton, Dudley. After the talk we went to the house on the corner of North Street and Church Street where Ma Pardoe was born and it was noted how it has not changed much since their day. “THE BRIDGTONIAN” PAGES HAVE NOW BEEN BROUGHT UP TO DATE . WE NOW HAVE A FULL SET OF ALL THOSE PRODUCED BETWEEN SUMMER 2012 & WINTER 2017 . YOU CAN READ THEM BY CLICKING ON THE COLOURED BRIDGTONIANS. “THE HERITAGE TRAIL” IS ALSO CURRENT AND GIVES PICTURES , LOCATION AND SOME OF ITS CONTENTS. The May talk by Graham Bowman about the New Zealand Earthquakes went down well and was well attended. Even though the talk wasn’t local or strictly history it gave a view of New Zealand after the quakes that few of us realised. Graham was there 2 years after the destructive quakes and rather than talking about the materialistic demolition it was more the effect on local life. His film show was well constructed and he gave a clear talk with it. Thank you Graham, your talk gave us food for thought. In the last week or so I have received letters from our outlying members updating their memberships and supplying more information. Mrs Rosemary Smart from Devon has spotted an error by myself where I incorrectly gave her maiden name as “Cleeton” when it should be “Winfer”. Apologies , Rosemary, it has now been corrected. Mr Geoffrey Morris wrote from Jersey, where he mourned the loss of David Battersby and mentioned that the article of David’s in the Bridgtonian highlighted the two Whitehouse Headmistresses at Bridgtown School who were Great Aunts of Geoffrey’s with Mabel being the first and Millicent next. He also sent a photocopy of a photo of St. Peters Church Choir taken for the Harvest Festival in 1957 or 1958. He has also provided names where he remembers them. It’s great to have pictures – but to have written information to go with them brings them to life along with the people on them. These are the items we can archive and preserve for later generations. Our Annual General Meeting takes place on Wednesday 2nd May 2018 at 10.00am at the Bethel as shown below and we hope you can come and show your support for us in the coming year. 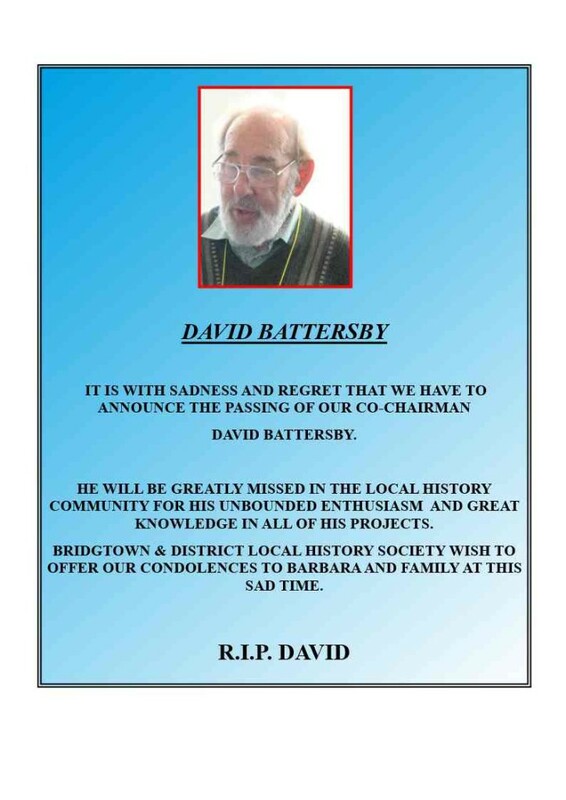 The family of David Battersby have kindly given us a lot of David’s research notes and articles he collected over the years appertaining to the history of the local area and this year will see us archiving that material. It does include a lot of Cannock history and we would like any of you with Cannock roots to help with that archiving. After the AGM there will be a talk by John Devey who wrote the first of the Bridgtown Definitive history volumes about the First World War and its effects . The books will go on sale at 12.00pm until 2.00pm and a buffet lunch will be available. IT IS RENEWAL TIME FOR SUBSCRIPTIONS. THE PRICE IS REMAINING AT £7.00 PER HOUSEHOLD. APPROX. 10:30am JOHN DEVEY will give a presentation on the 1st book of the Definitive History Series ” World War 1″. After the presentation the books will go on sale 12.00pm until 2.00pm when a buffet lunch will be available. As you see from the “Events” page, the itinerary for the next month or so has been settled. A COFFEE MORNING: will be held on Wednesday 4th April at the Bethel Church from 10.00am til noon. It will be an informal affair and we hope you will try to attend and meet and chat to old friends, work colleagues and fellow Bridgtonians. Light refreshments will be available as will members of the “Team” to assist in any queries you may have. These mornings will be an ongoing thing if they attract enough people. (We hope to have them every month replacing our more formal Team meetings 2 months every quarter). Please let us know if you want a more structured event. WEDNESDAY 18th APRIL 2018 : UNVEILING OF 4th HERITAGE TRAIL BOARD at LONGFORD HOUSE at 11.00am. ALL THOSE WISHING TO ATTEND PLEASE BE AT THE SITE (CORNER OF WATLING STREET & WOLVERHAMPTON ROAD) BEFORE 11.00am. REFRESHMENTS WILL BE AVAILABLE AFTERWARDS AT THE LONGFORD HOUSE FACILITY. After a busy meeting it was decided to reduce the Team Meetings to 1 every 3 months and use the interim times as more informal coffee mornings at which everyone could be involved and we believe more could be achieved. An interim programme for the next month has been tentatively made and could change as we firm up the dates. 21st March – Normal “speaker day”at Bethel, 10.00 to noon – Derrick Middleton with his completion of the Street history of Bridgtown. 4th April – Coffee morning at the Bethel 10.00 to noon and any final arrangements for the forthcoming events. 18th April – Unveiling of the Longford Board. Start at 11.00 am. at Longford. Marion and Barbara Battersby will be asked to officiate . After we hope to have refreshments available at Longford House. After the upheaval of the last month the Society Team has been discussing the future of the Society and where we go after the loss of David Battersby. Various roles covered by David have to be taken up by the team, not least the management of the Talks and Events. His contacts were wide reaching and we have to re-establish those contacts. The other roles David carried out will be worked out at the AGM in May. 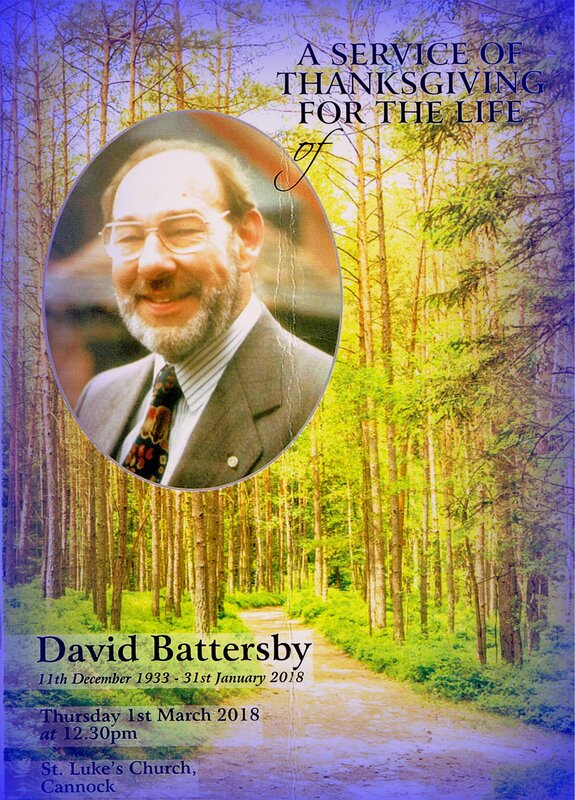 A service of remembrance and celebration of the life of Mr. David Battersby was held at St. Lukes Church, Cannock. The weather was atrocious with storm Emma blowing the snow and us around. This did not put off the friends and family of David from celebrating his full and devoted life. There were over 250 in the church( a very quick headcount) as well as close family. The service was taken by David Gethin who was a great friend of David. Tributes were given by Mr. Michael Miller of the Rotary Club, Mr. John Devey of the Bridgtown History Society and Mrs Chris Shaw of the Stafford Bee Keepers association. All showed how Davids dedication to his various interests was total. The Family Tributes were both emotional and poignant and gave an insight into Davids family life to which he was also dedicated and his sense of fun and humour. David was unique. He was a gentleman who stood by his principles and put 100% into all he did. He will be greatly missed by all who knew him.